At long last, we finally made the link-up with Robert, Laura, and the boys. We arrived at Diamond Lake RV Resort in southern Oregon about an hour before they did, which gave us plenty of time to set up and brace ourselves for the explosive energy of three little boys! More on that below. But first, Crater Lake. For a while, we thought Badlands National Park presented the weirdest geology we could imagine. Then it was Bryce Canyon National Park. But now, it’s Crater Lake. Definitely Crater Lake. Hands down, the lifetime achievement award for weird geology goes to Crater Lake. After the collapse of Mount Mazama, there was a rim with a three thousand foot deep crater inside of it. Over the course of the next couple hundred years, the crater filled with water from rain and melted snow and, due to an area of permeable material that acts as a sort-of “overflow drain,” the level of the water has remained constant ever since. 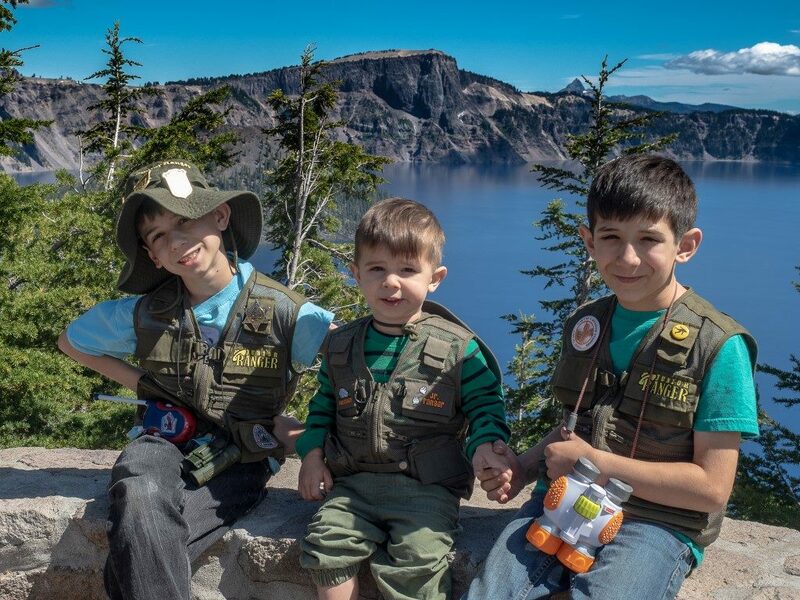 Presto change-o, Crater Lake. 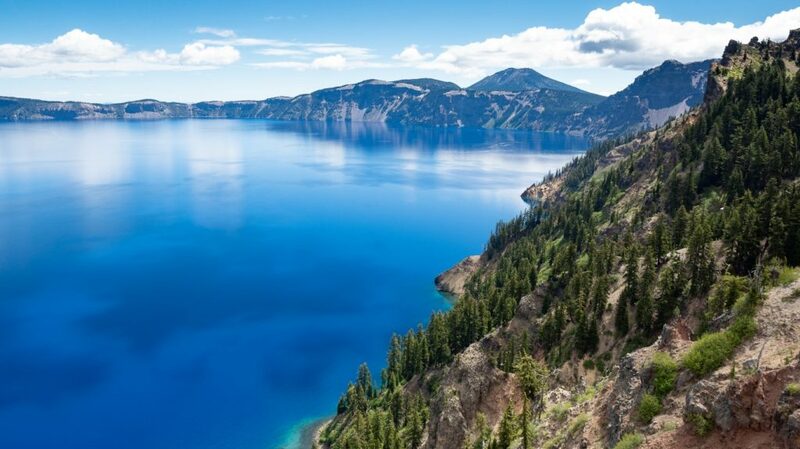 At 1900 feet deep, it is the deepest lake in the United States, and one of the deepest in the entire world. Which brings up the second too-weird-to-be-true aspect of Crater Lake. 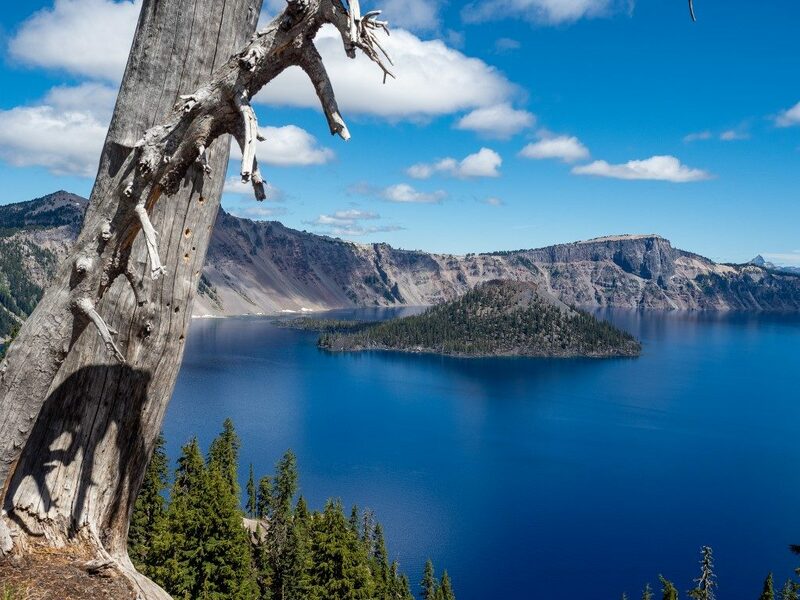 There are no streams that flow into Crater Lake, which means that the water is only rainfall and melted snow, which in turn means that the lake is filled with only distilled water. No sediment, no organic matter, no nothing. Pure water. As a result, there is a color and a clarity to the lake water that is seen nowhere else on earth. They call this color “Radiant Blue,” but that doesn’t begin to do it justice. Scientists have measured the light from the lake for both radiance and hue, and the color occurs nowhere else on earth. The water is so clear that there’s enough light at 450 feet below the surface to support plant life. In essence, there’s a column of water hundreds of feet deep, all across the four to six mile width of the lake, emitting blue light over its entire depth. I’ve mentioned the idea before that certain scenes in national parks are “breathtaking” in a literal sense. 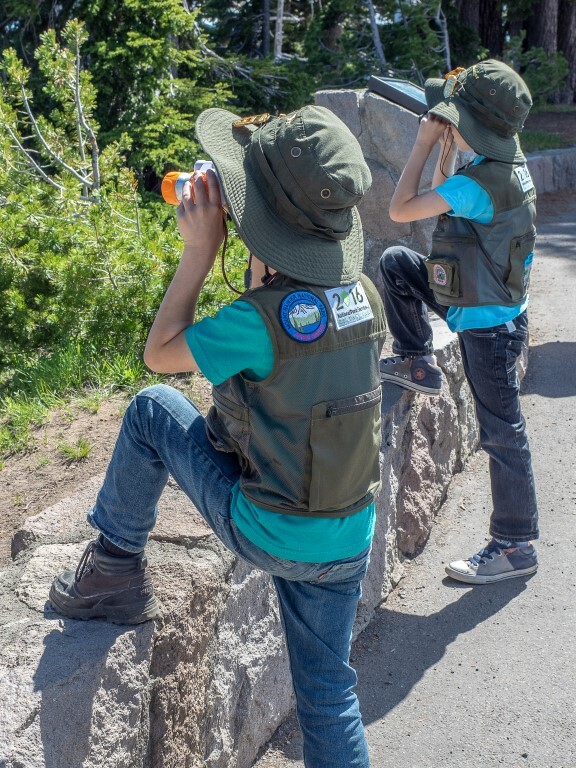 One of the rangers mentioned that they watch people when they first see Crater Lake and the rangers call the experience “sucking air,” that sound visitors make when they audibly gasp because what they see before them literally takes their breath away. For all that, there was one downside to Crater Lake. The trail and vantage points around the rim all present a life-threatening fall down rocky slopes. Everywhere there are signs that read: “DANGER! FALLS CAN BE FATAL! DO NOT CROSS THE WALL!” Traveling with three young boys, all of whom love to climb and jump, and for whom a low wall is something to walk along or, even worse, jump over, made for some casual, carefree walks along the rim. Not. What one can’t see in this picture is three adults perched inches away from these Little Darlings ready to make a sudden grab in case one of them decides to swing his feet around to the other side of the wall. Cute, aren’t they? Except that these guys are within inches of certainly fatal fall. Robert and Laura, like us, always include a picnic lunch in the middle of the day, but the dangers to three unpredictable boys from the precipice along the rim caused us to move away from the rim for the mid-day break. Fortunately, there was a picnic area not too far away, which allowed the boys to climb on lava flows, fallen trees, and boulders, all of which present nothing more than the usual risks of cuts, bruises, and concussions. In other words, a relaxed environment. This entry was posted in Travels on July 1, 2018 by skiprd.